Chilly weather is here and what’s better than having comfort and warm food for this weather. How about some yummy winter salad? Some nice crunchy and healthy salad which provides you with instant energy and keeps you hydrated all day. Let’s see some of the interesting and mouth-watering winter salad recipes to break your hunger cravings. 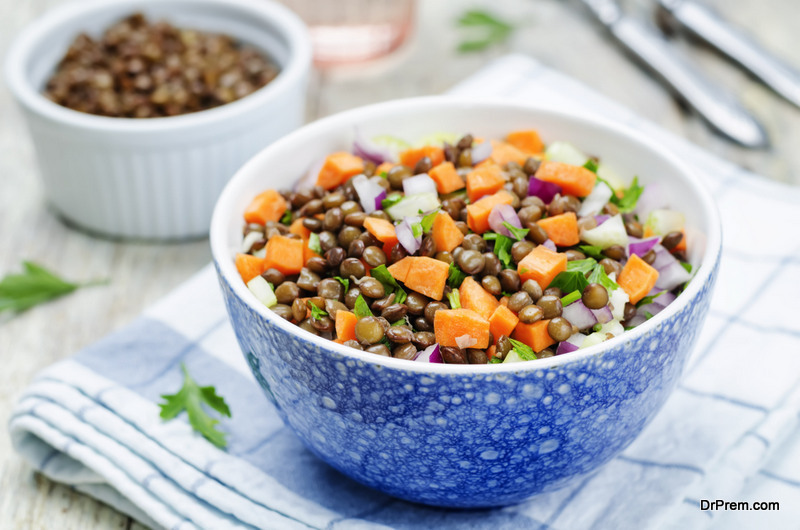 Coconut with carrot and lentil makes for some nice and healthy option to make the winter salad with. This salad recipe is just the answer to this cold weather, it tastes awesome and you have it in your lunch or dinner. Let’s see how to prepare it. Now warm up coconut oil and pour it into the carrots so that those carrots are properly glazed. Now transfer the carrots in the baking tray, sprinkle some chopped coriander in it and pinch of salt. Roast it for around 30 minutes. After transferring it into the bowl, add lentils, vinegar, and coriander. Mix it properly and season it with salt and pepper according to your taste. Your wholesome warm carrot salad is ready. It is easy to make, has full of nutrition value in it. Carrots and lentils have full of protein and little fat which is beneficial for your health and one of the best recipes for vegetarians. It provides you with warmth and comfort. 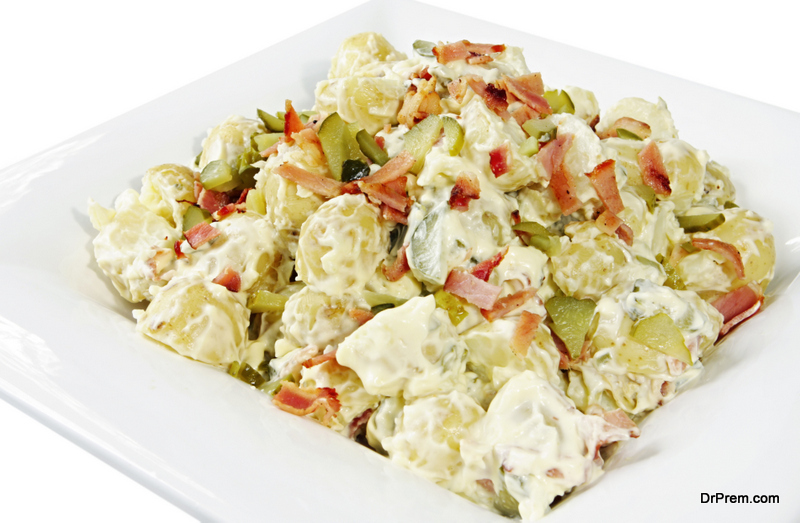 This warm potato salad is just ideal and perfect for your lunch. You can prepare it quickly after adding just a few ingredients. Italian long hots – 2. At first, toss the longs hots in a pan with little oil. Season some salt into it so that it becomes soft. Now preheat oven at 350 degrees and lay bacon slices into the baking tray. Cook it for about 20 minutes until the bacon turns golden and crisp. Drain the excess oil. In another saucepan pan, place potatoes with water and salt. Bring it to a boil and cook until the potatoes turn soft. Transfer the potatoes to a large bowl, add peppers and the oil. Crumble the bacon over the potatoes. Mix it well mashing some of the potatoes a little. Add some more salt and pepper if needed. Transfer it to a serving tray, add chives for garnishing and serve the salad with sour cream. This yummy potato salad just tastes amazing with fennel and goat cheese. This is the best winter salad recipes you can have. It satisfies your hunger cravings and keeps you warm. Try this warm winter salad recipe to have a warm treat at chilly weather. 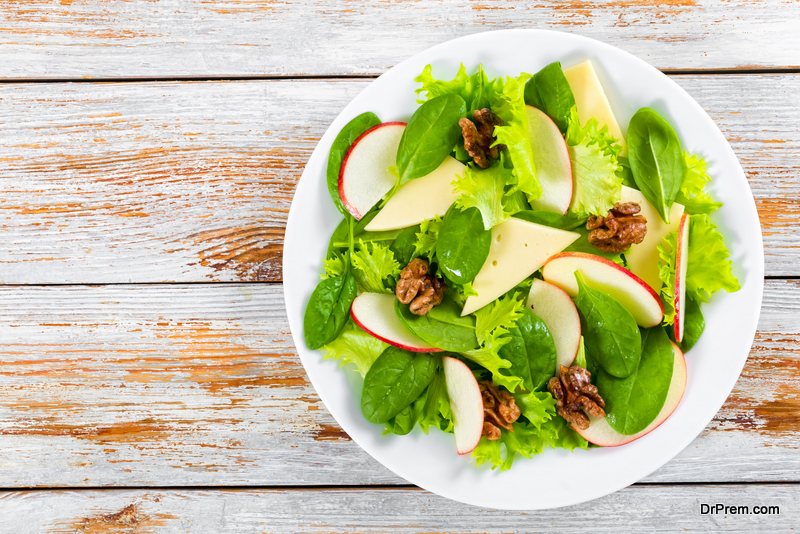 Warm apple salad with apple salad vinegar is a great choice if you are working out and want a great option for weight loss. This wholesome salad is best for the people who want some light and healthy recipe to munch. In a bowl mixing bowl add the entire dressing ingredient together and mix it properly. Now add raisins to it. Mix it well. Heat oil in a pan and roast the almonds until it becomes golden brown in color. Keep it aside. In the same pan, take 1 tbsp olive oil and add sliced shallot, sauté it for two minutes until it releases a nice fragrant. Now add sliced apple and toss it for just minute. Do not overcook it. Now the final step, take a large bowl, add salad greens and the dressing into it, mix the apple mixture into it. Top it with raisins, almonds, and cheese. Season it with salt and paper and the yummy salad is ready. Enjoy it anytime mostly at mornings and for lunch. A healthy option which provides with wholesome nutrients of apple and dry fruits. A must try winter salad.